As you read this, pause for a moment, and begin to give attention to the position you are in. 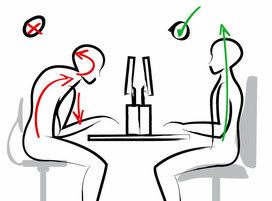 Is your back straight or bent, and if bent in what way? What is happening to your abdomen, is it compressed? What is happening to your shoulders? Is your head on one side? If you are sitting, are your feet touching the floor? Where are your legs and arms? What is the expression on your face? For example, do you tend to frown, or raise your eyebrows when you read? Have you been in this position for quite a long time? Is it beginning to feel fixed and stiff? Do you notice other sensations in your body? These are all observations about how you are using your self while reading. Please don’t make assumptions at this stage about what is good use and what is misuse. These will be explained later in the book. For now, simply observe what is going on with curiosity, but without judgement. If you are feeling fixed and stiff, take a few moments to stretch and move around however you wish, all the time giving your attention to the way in which you are moving. I am not asking you to try to do it ’right’, just to notice what is going on, giving your attention to your bodily movements. 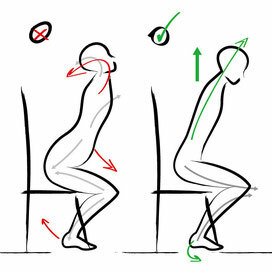 Our use involves the positions we put our bodies in and the movements that we make getting from one position to another. But the way in which we use our selves is not restricted to the way in which we use our bodies. Alexander was concerned with the whole Self, and how we use it. Our thoughts and feelings play as great a part in our use as do our physical movements. In fact they are inseparable. The mental decision to do even the simplest activity, such as walking, sitting, or standing, precedes and is maintained during that activity. Alexander called this psycho-physical unity. He demonstrated that every 'physical' activity has a mental component, and every ’mental’ activity has a physical component. What we are thinking and feeling when we sit, stand, wash the dishes or drive a car is going to affect the way in which we do it enormously. And this is even more true for stressful situations, such as taking examinations or performing in front of an audience. If you now add to your observations about how you are using your body, observations about the thoughts and feelings you are having as you read this book, you will be getting more information about your use. For some people the reading will feel like a treat and for others it will feel like a chore. Some people will be thinking in agreement with me and other people will be having very critical thoughts. And the person who finds the reading a treat may also be the person who is highly critical of what she is reading. And in addition to thoughts about the book there are probably lots of other thoughts popping into your mind which you may notice. Our mental and emotional responses are complex and unique to each one of us. What do you observe about your mental and emotional responses? In particular, notice your reaction to being asked to stop and observe what you are doing, sensing, thinking and feeling. Is this easy for you or does it fill you with irritation and resistance? Much of our behaviour is governed by habit. It would be impossible to survive if we did not have the ability to operate automatically, responding to stimuli in a learned habitual way. If you have ever learned to drive a car, or ride a bicycle, you will probably have experienced how something that seemed impossibly difficult and complex initially, changes into an easy habitual activity. Developing habits is an essential part of the way in which we learn new skills. Habitual behaviour is something we do without having consciously to think about it, or with a minimum of attention, and this allows our minds to give attention to other matters. For example, having learned how to stand as a child, as an adult it is fairly easy to stand and read a newspaper at the same time, and so our behaviour becomes more complex. This is fine if we learned our skills in a way that is beneficial to us, but it is a big stumbling block when we want to change the way we are operating in our lives. Because in order to change, first of all, we have once again to start consciously thinking about how we are doing something, and then we come up against the power of our habits, for even giving attention to our behaviour is contrary to habit. It can be very difficult to undo learned and habitual behaviour, and learning how to do this is a large part of what the Alexander Technique teaches. If it seems difficult to go back into that conscious awareness of how to drive a car, or ride a bicycle, then how much more difficult to unlearn habitual behaviour that was learned in our infancy, like sitting, standing, walking or talking. But if we wish to improve the use of the self then unlearning these old habits is what needs to happen. And before we can unlearn them we need to find out exactly what they are. As the story of this book unfolds it will become clearer What to look for when you observe your use, what Alexander meant by good use and misuse of the self. Beginning by observing oneself carefully, noticing how you do things without any concept of good and bad, is one of the first skills involved in the art of changing. You have already had a chance to pause and observe how you are using your mind and body while reading this. From now on, start giving some conscious attention to your use, how you are doing all those many activities that make up your life. Every so often during the day pause and notice what you feel is happening in your mind and body. Start to be aware of habitual behaviour, not just physical habits, but mental and emotional habits too. I would recommend that you keep a notebook in which you make all these observations, as this is one way in which you can notice the changes you are making as you proceed with this work. It is entirely up to you how much time you give to this process of self-observation. As this activity is probably not habitual for you, it will be interesting to see how difficult you find it to incorporate this non-habitual behaviour of observing yourself into your life. It only requires a few seconds or minutes, every so often, and it is likely that if you turn this into a chore, then that is another of your habitual tendencies, or if you forget to do it, that is another. A sense of humour about oneself is helpful when one begins this journey into self-awareness, but that may not be your habit! Observe yourself as though you are some strange creature from another planet whose behaviour you find utterly fascinating. If you can cultivate that (probably non-habitual) attitude you will find this work the more enjoyable. Next is a list of activities you may like to observe in yourself. This list could go on endlessly, so I shall just suggest a few things, but I hope you will be looking for other types of habitual behaviour, in addition to my suggestions. It is better that you give attention to these activities every so often throughout the day, rather than putting aside a special time for them, because then you are developing a new habit of being self-aware as you live your life, and as you practise this you will learn much more about yourself and how you use yourself than if you create an unreal practice situation in which to observe yourself.